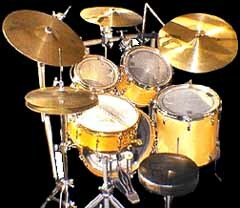 The standard drumset usually involves a snare drum, bass drum, 1 or more tom-toms and a floor tom with ride, hi-hat, and crash cymbals. This instrument is interesting because it involves all four limbs in its playing technique. Pictured here is my Gretsch drumset with K. Zildjian cymbals, with Tama and Pearl hardware.